The Dutch government’s censorship of sensitive locations has become an iconic feature of our online Maps landscape. These interventions are slowly disappearing, but looking back though the lens of Google Earth’s Historical Imagery feature, what can we see beneath? In the beginning there was only the void, and no censorship was required. In the year 2000 a tiny square on the West side of Amsterdam’s city center is imaged in detail. Larger tracts of the Netherlands are imaged in 2002 and 2003, but these appear to be of little concern to the government at the time. Sensitive locations appear uncensored. Only when Marinecomplex Kattenburg is passed over in June 2004 does the first audit become apparent. It is simply cut out of the map. Pay no attention to the gaping hole in your city. It becomes clear that high resolution aerial imagery will soon be available to the public, and for the following year all imagery audited for security. No decision appears to have been made on a uniform means of doing so. Some areas are hidden beneath solid fills, others obfuscated by pixelization. The Ministry of Defence itself has an old image of itself pasted over the top of the new one, and the crystallize effect makes its first appearance. The secret sites of the Netherlands are hidden, but not the way we’re now used to seeing them. The Ministry of Defence. First imaged in 2003, subsequent updates to the surroundings were censored by pasting over the 2003 version. Aggressively crystallized in 2005. In 2005 Google’s Maps and Earth products are released. A 2006 update includes imagery for most of the Netherlands, and a minor Ballardian apocalypse takes place. Someone, somewhere in a government building has been tasked with censorship of all military sites, and apparently a decision has been made as to how. The effect applied is now commonly recognised as the Dutch Google Maps censorship, aka Photoshop’s Crystallize filter. Huis Ten Bosch (former residence of Queen Beatrix). Uncensored in 2003, the fine-grained crystallize effect added in June of 2005 is re-applied more strongly later that year. The only clues we have that a slightly more sophisticated method than vanilla Photoshop may have been used are the sites in Noordwijk and Ouddorp. Here the patterns appear to be generated by the same underlying algorithm but coloured together in groups, an added effect not achievable with the Crystallize filter. All other sites are uniformly crystallized, bar those previously censored with a finer grained setting of the same effect. These sites needed to be much more secure. Obviously best achieved with bigger, blockier polygons. Left: ‘The Blob’ in Noordwijk. Polygons are colored together in small groups. Middle: Echelon Ouddorp. Polygons are coloured together in larger groups. Right: Airbase De Peel. Here the standard Crystallize effect has been used. Only a few months after the crystallocalypse, its slow decline had already started. Various airports, former NATO bases and military barracks were uncensored, and in subsequent years more previously hidden locations have been revealed. It’s no surprise that in matters of security a state might err on the side of caution, but with the 2013 repeal of the law forbidding aerial photography in the Netherlands it appears its editing of the imagery Google released in 2006 had been rather overzealous. Military Airbase Soesterberg. First only half imaged and obscured with fine-grained crystallization, Later updated with the ‘standard’ crystallize effect. In 2007 censorship of the base is no longer deemed necessary. Slowly now the Netherlands decrystallize. With each update of Maps more sites re-emerge having shed their polygonal shields. The effect is leaving our maps but has stuck in our collective imagination. Not just inspiration to artists, the crystallize effect has now appeared in the uniform of the Netherland’s Armed Forces, making it an integral part of the Dutch state identity. As a security state and as international executors of force, we can rest assured that Voronoi diagrams seeded from grids of pseudo-random points in Euclidian space will continue to keep our nation safe for many years to come. NFP Green & NFP Tan. 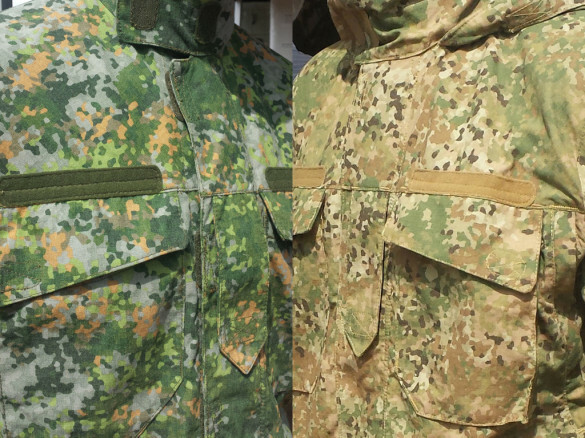 The Netherlands military’s new camouflage patterns. Want to go on your own tour of the censored locations of the Netherlands? Download this .KMZ file and open in Google Earth. Remember to switch on Historical Imagery! Wat zit er achter de Blob?